Dur­ing its 30 year exis­tence, the Trust has pro­mot­ed projects to pro­mote inter­est in the his­to­ry and vis­i­ble her­itage of the print­ing indus­try in Scot­land. Details of some of them are giv­en below. In Novem­ber and Decem­ber 2018, to mark the 30th anniver­sary of the Trust’s estab­lish­ment, an exhi­bi­tion on the her­itage of Scotland’s print­ing indus­try has been put on in the Glas­gow Her­ald’s for­mer print­ing works, the Light­house, Mitchell Lane, Glas­gow. The free exhi­bi­tion, More than just books runs from 9 Novem­ber 2018 to 6 Jan­u­ary 2019, and is free. arranges guid­ed walks, on the theme of Edin­burgh in print, based on the Edin­burgh Print Trail leaflet for exam­ple as part of the annu­al Doors Open Day pro­gramme in Sep­tem­ber. A new Glas­gow Print Trail leaflet has been pub­lished in 2018. In June 2016, the Trust ran a joint event in asso­ci­a­tion with the Scot­tish Local His­to­ry Forum, includ­ing a walk around Edinburgh’s Old Town look­ing at places asso­ci­at­ed with the print­ing indus­try. Fol­low the link to see some pic­tures of Walk & talk — Edin­burgh in Print. The Trust arranges guid­ed walks, on the theme of Edin­burgh in print, based on the Edin­burgh Print Trail leaflet for exam­ple as part of the annu­al Doors Open Day pro­gramme in Sep­tem­ber. A new Glas­gow Print Trail leaflet has been pub­lished in 2018. The Trust also pro­motes train­ing in tra­di­tion­al let­ter­press skills, for exam­ple at the Uni­ver­si­ty of Stir­ling. The nine­teenth cen­tu­ry Columbian print­ing press in the Path­foot build­ing has been restored to work­ing order, and the ‘Path­foot Press’ was on dis­play at the March 2017 open day cel­e­brat­ing the university’s 50th anniver­sary of the uni­ver­si­ty. The ‘Cos­sar Patent Flat Bed Web News­pa­per Print­ing Machine’ was devel­oped by Tom Cos­sar of the Clyde­bank firm, John Cos­sar Ltd. In March 2012, the Cos­sar print­ing machine was removed from the premis­es of David Philips Print­ers where it had print­ed the Strat­hearn Her­ald every week from its instal­la­tion in 1907 until 28 March 1991. The 1907 Crieff Cos­sar has now been rebuilt and restored to work­ing order. It is in stor­age in Gov­an, near its inventor’s child­hood home, before mov­ing to Nation­al Muse­ums Scotland’s Nation­al Muse­ums Col­lec­tion Cen­tre in Edin­burgh. You can watch a clip of its last run, and read more about the back­ground and his­to­ry of this press on the project page. The project received gen­er­ous sup­port from the Nation­al Print­ing Her­itage Trust, the Scot­tish News­pa­per Soci­ety, Unite the Union and the Oxford Guild of Print­ers as well as indi­vid­ual donors. A 1907 Cos­sar Club has been set up to bring togeth­er any­one with in inter­est in this machine. In 2010, the Trust, in asso­ci­a­tion with Graph­ic Enter­prise Scot­land, now Print Scot­land, pub­lished Mechan­i­cal to dig­i­tal print­ing in Scot­land: the employ­ers’ organ­isaton by Pro­fes­sor John Gen­nard, chart­ing the 100 year his­tory of the Scot­tish print employ­ers’ organ­i­sa­tion. You can buy this title, and all Trust pub­li­ca­tions through our online shop. If you pre­fer to order offline, you can down­load an order form. 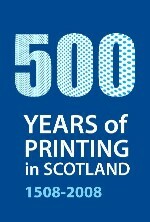 The Trust’s pre­vi­ous major project, in asso­ci­a­tion with the Nation­al Library of Scot­land and the Scot­tish Print Employ­ers Fed­er­a­tion (now Print Scot­land), was the cel­e­bra­tion of the 500th anniver­sary of the intro­duc­tion of print­ing to Scot­land which began in 2007. Through­out 2008 insti­tu­tions and organ­i­sa­tions through­out Scot­land marked Scotland’s Year of the Print­ed Word. On 15 Sep­tem­ber 1507, James IV of Scot­land grant­ed Wal­ter Chep­man, an Edin­burgh mer­chant, and his busi­ness part­ner Androw Myl­lar, a book­seller, the first roy­al licence for print­ing in Scot­land. Although the licence was actu­al­ly grant­ed to enable the print­ing of the Aberdeen bre­viary, a book of Scot­tish church prac­tices and the lives of local saints, com­plied by William Elphin­stone, Bish­op of Aberdeen, The Com­plaint of the Black Knight by John Lydgate, is the first known work from the press set up by Chep­man and Myl­lar, print­ed on 4 April 1508 near what is now Edinburgh’s Cow­gate. Print­ing spread grad­u­al­ly through Scot­land, with a press estab­lished in St Andrews in 1552, a short-lived one in Stir­ling in 1571 and in Aberdeen in 1622, with oth­er major towns such as Glas­gow fol­low­ing lat­er in the sev­en­teenth cen­tu­ry. — co-oper­a­tion with the SAPPHIRE project team at Edin­burgh Napi­er Uni­ver­si­ty, par­tic­u­lar­ly on the project to record the rem­i­nis­cences of work­ers from Thomas Nel­son & Sons Spread­ing the print­ed word. For more infor­ma­tion about the Trust’s work con­tact the Hon­orary Sec­re­tary.